$586 - $655 / mo. 539 - 646 sq. 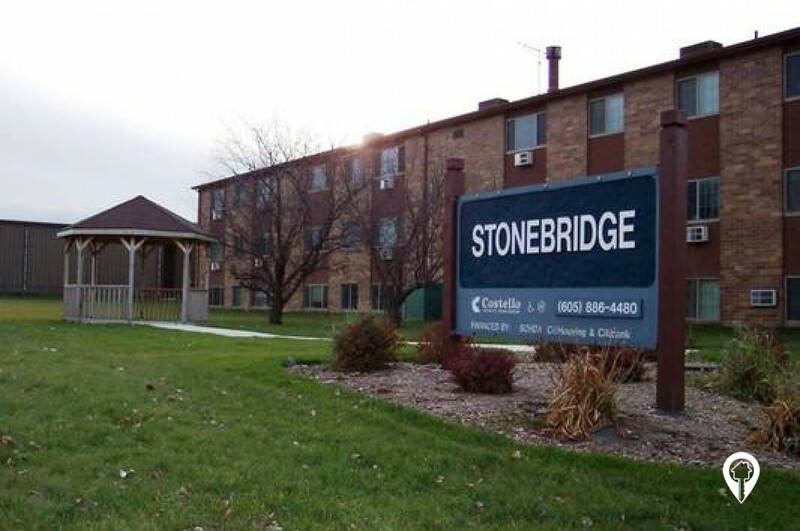 ft.
StoneBridge Apartments in Watertown, SD offer apartments for rent in the Watertown, SD area. StoneBridge Apartments are a 3 story brick building with limited door access. These apartments are handicap accessible and have off street parking available for residents. StoneBridge Apartments offer various amenities such as air conditioning, central heat, dead bolt locks, dishwasher, eat in kitchen, extra storage, master bedrooms, mini-blinds, pantry space, and walk-in closets. The StoneBridge Apartments community provides a community room, controlled access, elevator, handicap units, laundry facilities, lawn care, 24 hour maintenance, a picnic area, snow removal, and non-smoking buildings. Call and schedule your private showing today! 1 bed 1 bath $586 1 Bed / 1 Bath 539 - 646 sq. ft.
2 beds 1 bath $655 2 Bed / 1 Bath 561 - 646 sq. ft.
From take the Watertown Exit 177. Go west onto 9th Ave SE. Turn right at S Broadway. Take the first left onto 8th Ave SW. StoneBridge Apartments will be located on your left.